One of life’s great pleasures is picking perfectly ripe blackberries, still warm from the sun, and popping them directly into your mouth until you have juice dripping down your elbows. 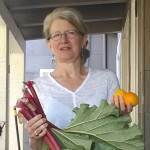 We have recently begun spending time in Oregon where blackberries thrive. Our backyard there was overrun, and I’ve spent hours attacking the vines to get them under control. I am determined to have beautifully trained vines. I know I’m a dreamer, but I also know I can be relentless with a pair of clippers in my hands. And I believe there is hope: still time to get the upper hand before August, when the berries are in their jet-black glory. In the meantime, I feel grateful for having received a gift of frozen, handpicked, wild blackberries from a local Oregonian forager. I’d much rather have frozen berries, picked ripe and sweet, than fresh berries picked under-ripe and sour, which is how you usually find them at the market. Not wanting to disappoint the forager or me or the berries, I tried to think of ways to show off these gorgeous fruits. “What do you want to be in your next life?” I asked the berries under my breath. 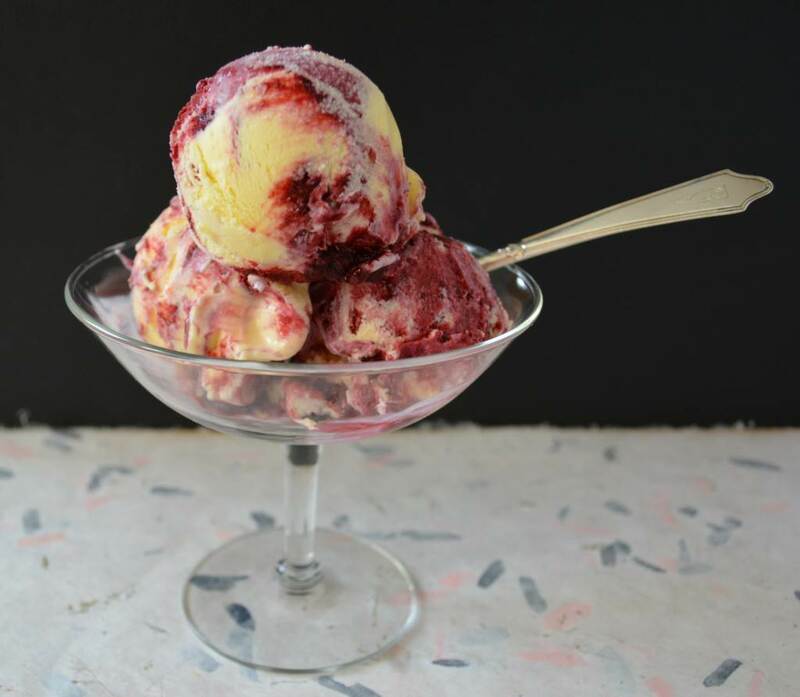 Without hesitation they replied, “Blackberry Swirl Ice Cream.” How could I argue? I cooked the berries with just enough sugar and lemon juice to heighten their flavor, pureed them, then swirled them into vanilla ice cream. 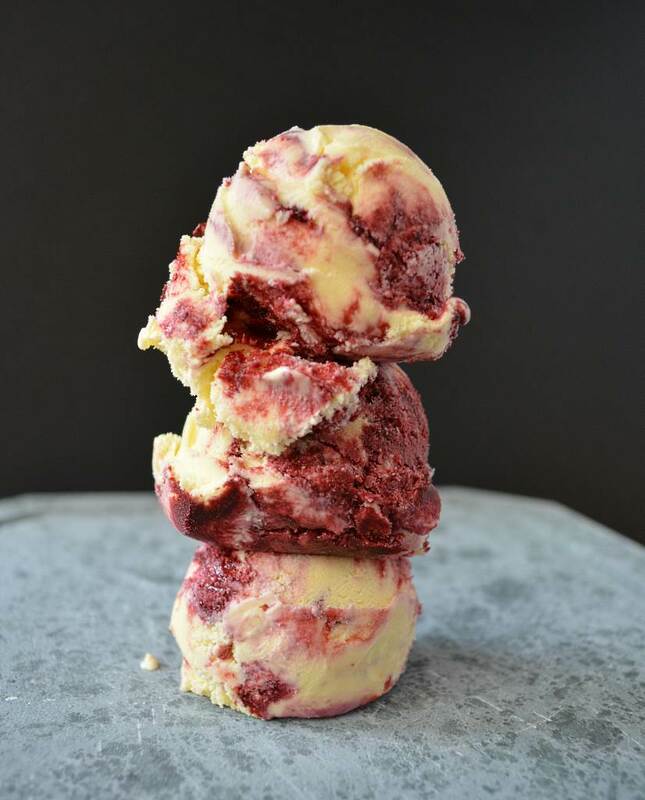 Because of the swirls each bite is full of contrasts: sweet and tart, creamy and fruity, dark and light. I think the mixture stands alone as a dessert. It needs no cake underneath, no cookie along side. 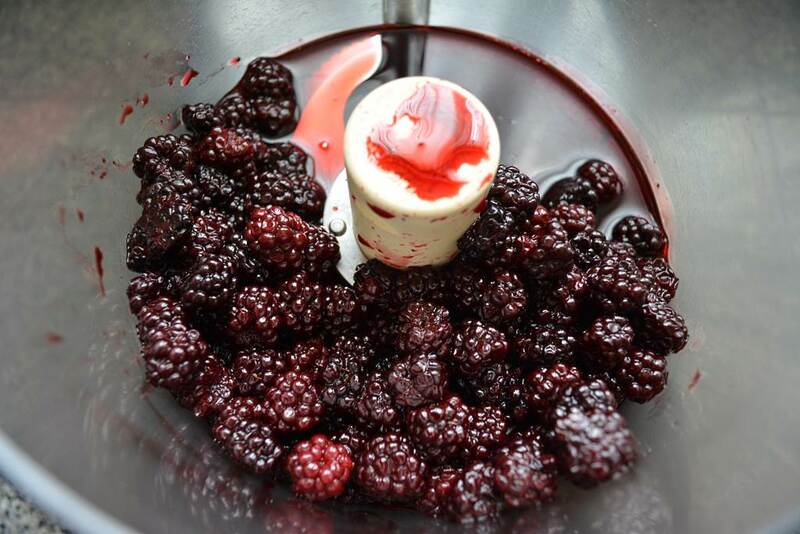 Save some of the blackberry puree to pour over the top. It is great without, but the sauce (magically it becomes a sauce if it’s not swirled in) gives it a little ooh-la-la! Scroll down to below the recipe to be serenaded by Blossom Dearie singing Give Him That Ooh-La-La! You’ll be glad you did! Puree the blackberries in a food processor, or a food mill (the advantage of a food mill is that you won’t have to strain the seeds out later). 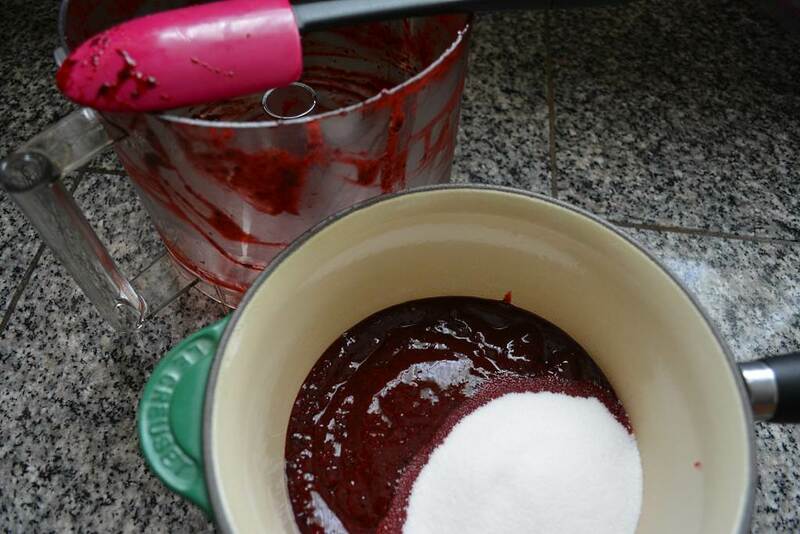 Combine the sugar with the berry puree and cook until slightly syrupy. Make the vanilla ice cream base. It is important to temper the eggs so that they don’t curdle. 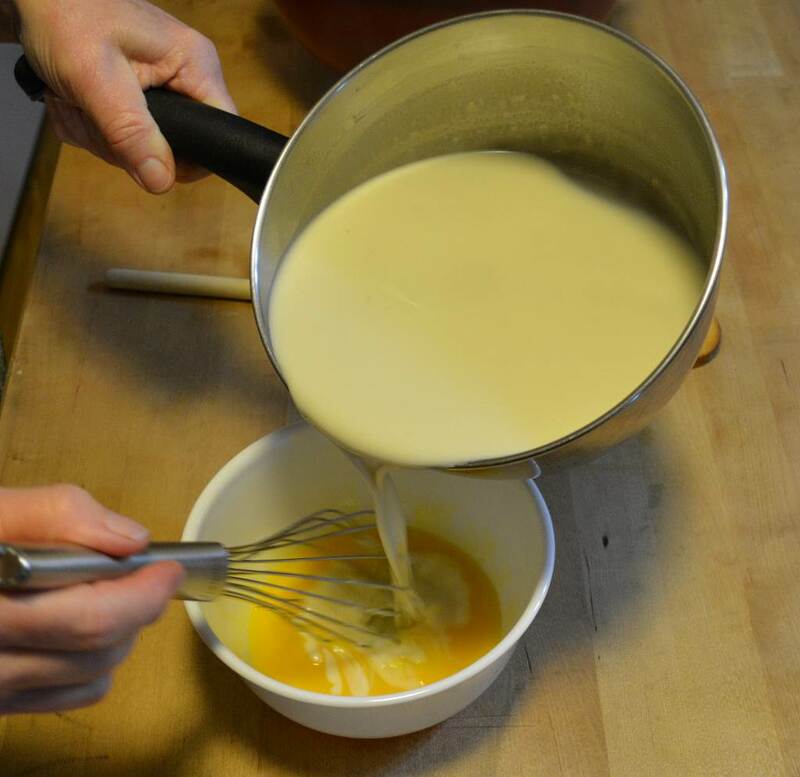 The bowl with the yolks is going to want move around while you are whisking in the cream, and you won’t be able to steady it with your other hand. Using a flat bottomed bowl helps, but you can also put a damp towel under your bowl to keep it still. The ice cream base is done when it has thickened enough to coat the back of your spoon. 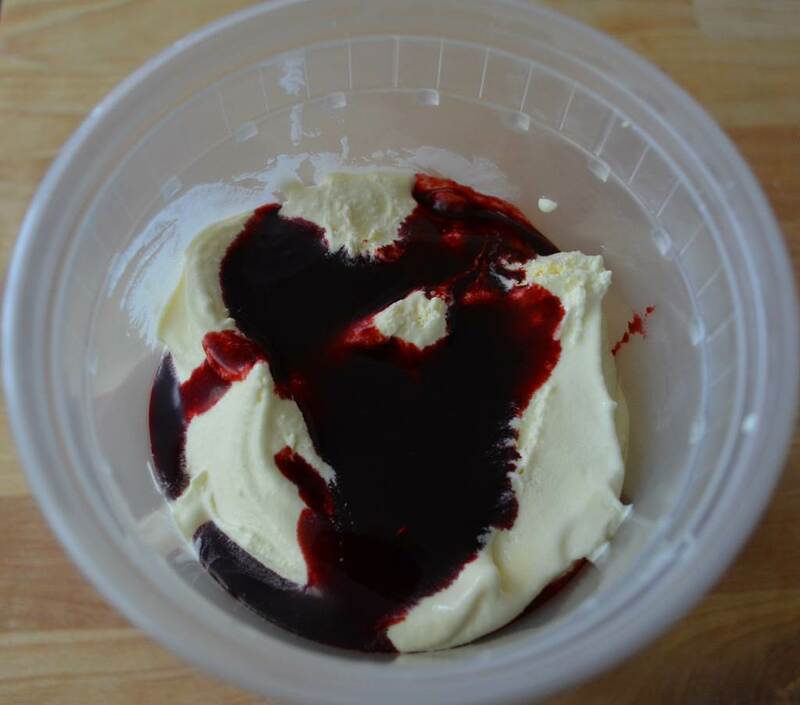 You will get more distinct swirls if you layer the ice cream and the puree in the storage container, rather than swirling the two together. I like to use these quart containers because they don’t take up too much space in the freezer, and have a nice tight lid. Press plastic wrap directly on top of the ice cream before covering to reduce the possibility of the ice crystals forming. Puree the blackberries (if using frozen, thaw a bit to soften) in a food processor. Place the berries, sugar, lemon juice and water into a saucepan and bring the mixture to a boil. 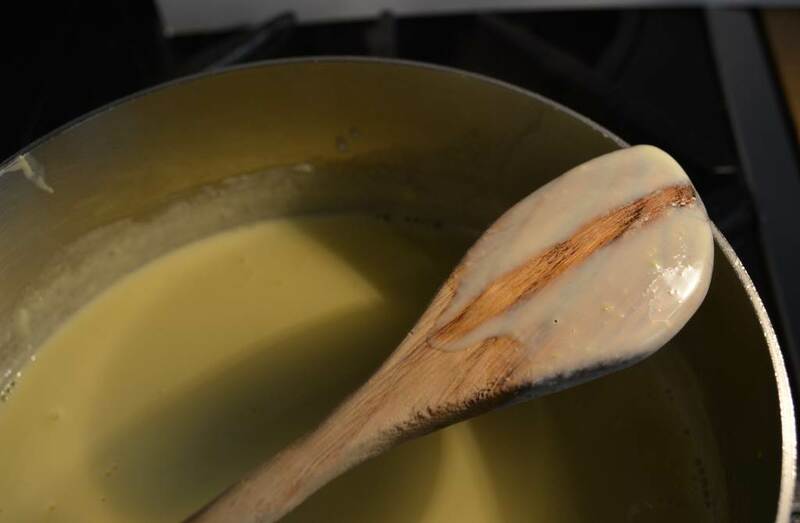 Reduce the heat and continue cooking, stirring occasionally, until the mixture thickens enough to coat the back of the spoon. Strain the mixture to remove the seeds. Chill the puree until very cold. Freeze a 6-cup or larger container to store the ice cream. Heat the milk, sugar and salt until it is hot, but not boiling. Place a strainer over the top of a medium bowl. In another medium bowl, whisk together the egg yolks. Slowly pour the hot milk mixture into the egg yolks, whisking constantly, then scrape the warmed egg yolks back into the saucepan. This step, called tempering, is very important because it helps prevent the yolks from curdling. Stir the mixture constantly over medium heat using a wooden spoon, making sure to scrape the entire bottom of the pot, until the mixture thickens enough to coat the back of the spoon. Do not let it boil or it will curdle. Pour the custard through the strainer. Remove the strainer from the bowl and add the cream, stir together. Add the vanilla extract. Place the bowl with the ice cream base into the bowl of ice water. Stir occasionally until cool. Refrigerate for at least 1 hour. Freeze in an ice cream maker according to the manufacturer’s instructions. Remove the chilled container from the freezer. 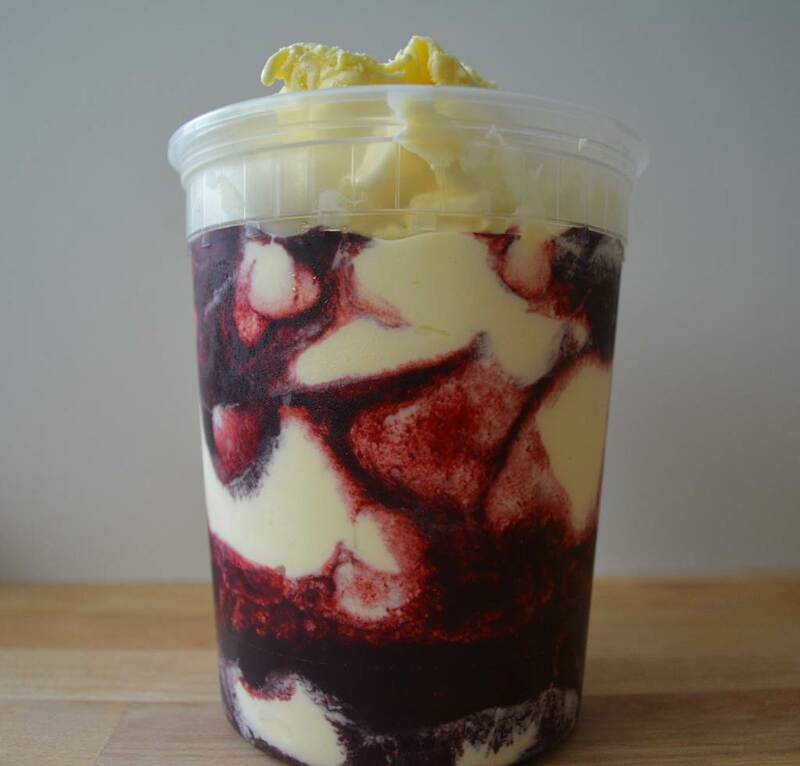 Layer the blackberry puree and vanilla ice cream, without mixing, into the container. 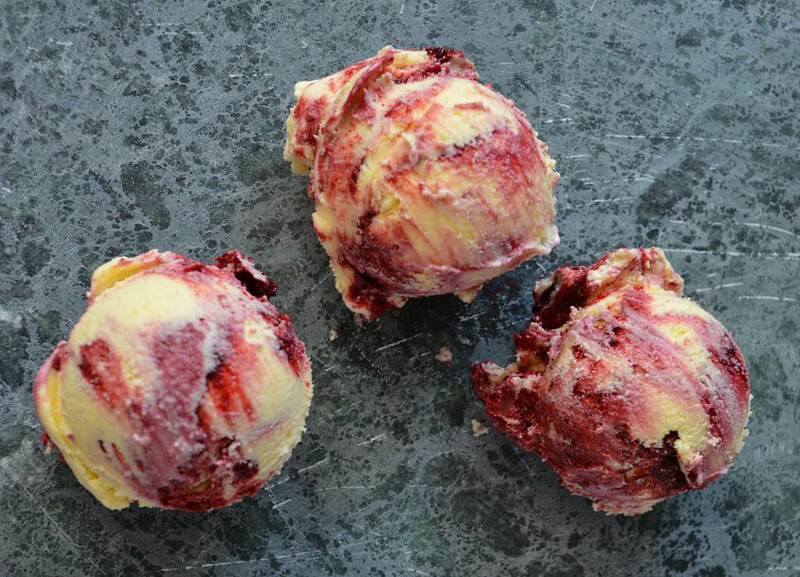 Chill in the freezer until firm enough to scoop. By layering the two mixtures, instead of swirling, the two flavors remain distinct. The swirls naturally happen as you scoop the ice cream. 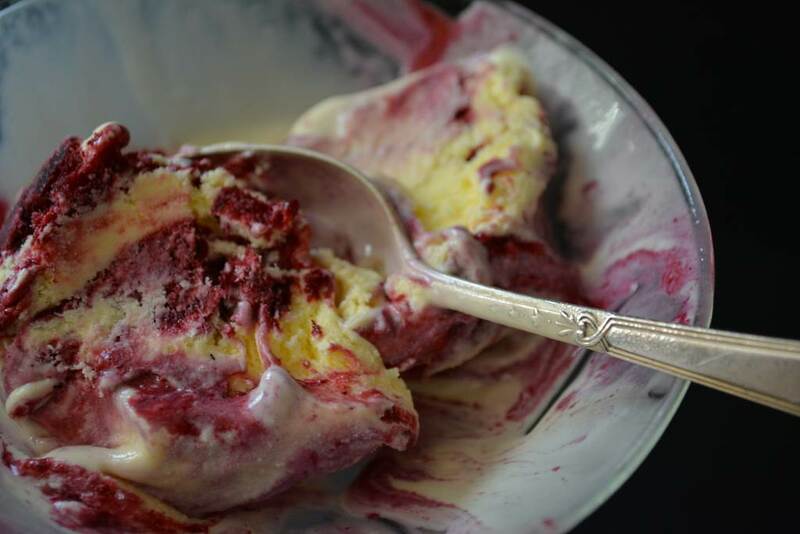 Bring the ice cream out of the freezer to soften slightly before serving--10 minutes on the counter is usually enough. Thawing the ice cream a bit will make it easier to scoop and it will taste better too. Thanks, Terri! Not sure if every post will bring to mind a song, but when the mood strikes.